I’m joining Gillian at Country Garden UK in her new weekly meme Looking Good in the Garden. She asks us to showcase what’s striking our fancy in our gardens each week and link back to her site, where we’ll see what’s special in other gardener’s plots around the globe. 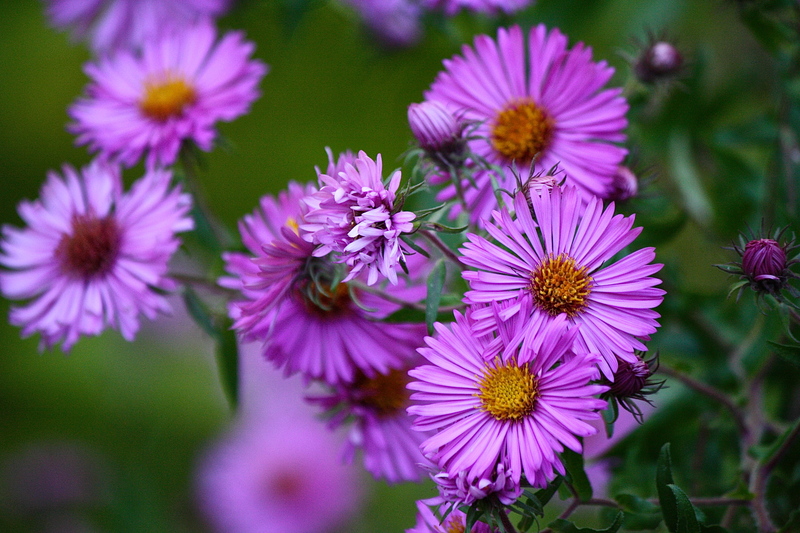 I place asters at the top of my list this week. They are looking great and the bees are covering them, feverishly gathering pollen in these last days before frost ends this garden season. The bright pink New England aster pictured here I believe is Symphyotrichum novae-angliae ‘Andenken an Alma Pötschke,’ which I’ve had for many years and very slowly has self-sown new plants throughout this bed. It grows to about four feet, then flops over when it blooms. I used to take better care of it, trimming it in early summer to keep it bushy and lower, and placing cages over it to keep it from flopping. The past couple of years I’ve grown lazy and just let it go do its thing and since the only other thing in the bed is Amsonia, it seems to work out. As I’ve posted in my Monday vases, I’m loving my wild asters, particularly blue wood aster (Symphyotrichum cordifolium). They form abundant mounds of blue-purple that are so pleasing to the eye. And I can’t go without mentioning the calico asters (Symphyotrichum lateriflorum), shown here with a happy bumblebee and the giant, white, lance-leaved asters (Symphyotrichum lanceolatum) that loom overhead, some over six feet tall, swaying in the breeze like great daisy wands. This entry was posted in Country Gardening, My Photos and tagged asters, bumblebee, fall flowers, flowers, gardening, gardens, Looking Good-Country Garden UK, Symphyotrichum, Symphyotrichum cordifolium, Symphyotrichum lateriflorum, Symphyotrichum novae-angliae 'Andenken an Alma Pötschke'. Bookmark the permalink. Thank you, Judy. The wild ones do self-sow a lot, but since most of my yard is wild, (and even my regular gardens are heading in that direction 😉 ) I don’t really mind their wandering! Many thanks, Sarah! Have a lovely weekend! 😀 Thanks, Julie! Have a great weekend. I love asters too but don’t grow many. I wonder if your wild asters would grow here in NW England? I can see a bit of research and some nursery visits coming up for me! You are happy with your taller asters doing their own thing and why not… in a country garden you don’t want things too straight and regimented and uniform. Let the parks do that and we will celebrate character in our plants! Thanks very much for linking up with Looking Good. Your support is most welcome. Thanks for hosting, Gillian. I think you got a good turnout for the first week. I’d expect asters to do well in your area. They are very frost hardy and there are so many great species and tons of cultivars to choose from! Yes. 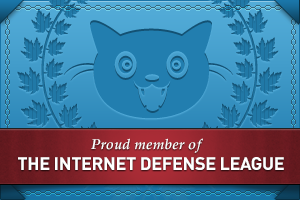 I am thrilled that 8 bloggers joined in for week 1. 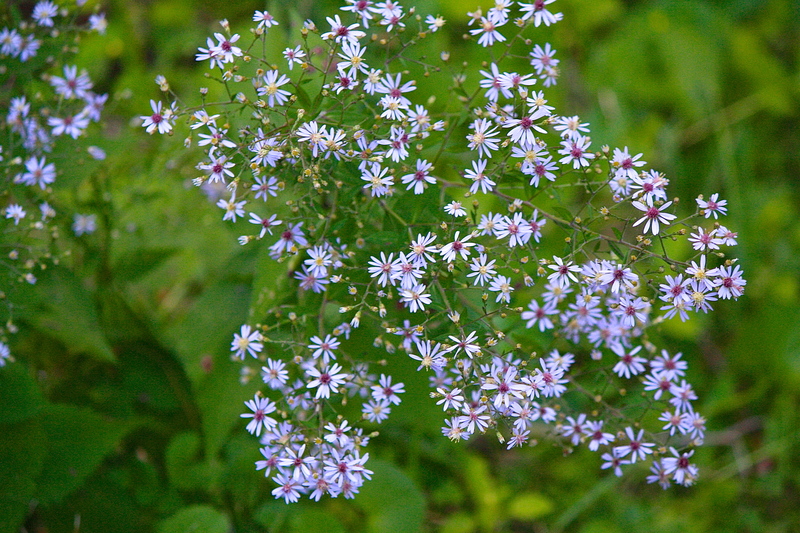 Thanks for the reply about Asters – checking them out locally now. I love all asters—those “star” flowers—but I was especially taken with the calico asters, which I have never seen in central Maine. I’ll be on the look-out. Thanks, Storm and the same to you. Are you getting all that rain? 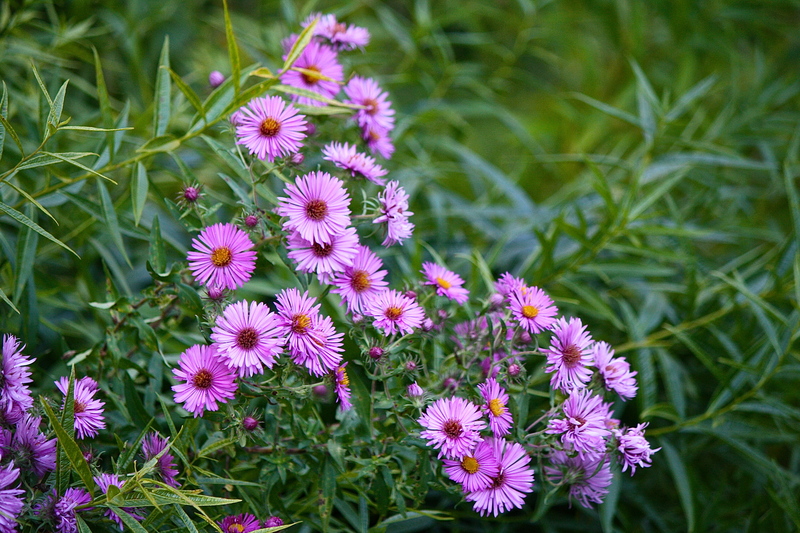 Beautiful fall asters! Nice to see that bee feeding on the blooms! 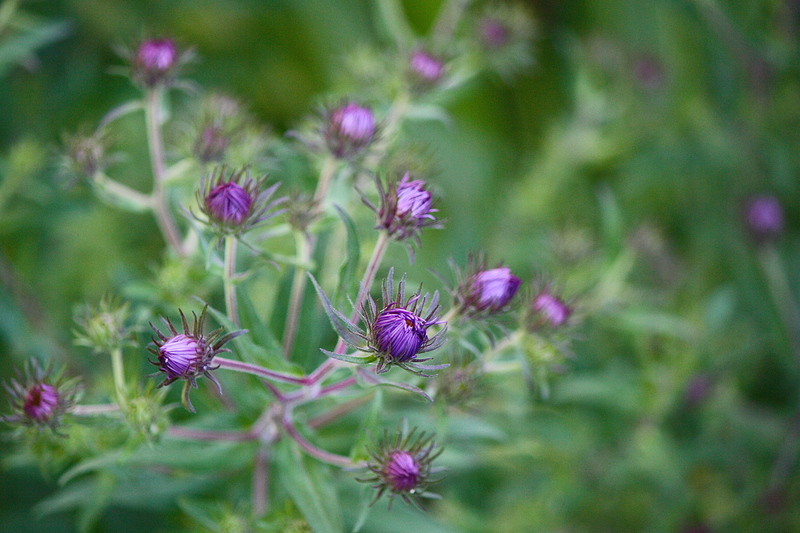 Mine (Symphyotrichum oblongifolium) will bloom up in October–looking forward to that. Thank you, Tina. Asters quietly wait in the background all summer, then wow, what a show they put on! Certainly makes it worth the wait! Thanks so much, Dor. Have a great weekend! I have just bought a couple of Asters, the bees certainly love them! Hopefully I will be buying more for my late border in the garden. Thanks for leaving a message. Looking good! – No great! Ha, that is funny, because I just spent Thursday morning staking our Symphyotrichum novae-angliae ‘Andenken an Alma Pötschke’, which had flopped following heavy rain. I adore the calico asters. I had a couple of ‘Lady in Black’, but I seem to have lost them this last year. Beautiful photos. What a great idea for a meme! I’ll plan to join in. Love your asters, Eliza. And what a special header you have now! Have you seen ‘Bing’s search page today? Synchronicity! How lovely. I am looking forward to everyone’s garden photos. Thank you for visiting my blog. Love those daisy wands Eliza! Your garden must be a real treat. These are beautiful. What beautiful wildflowers you have there Eliza! Thank you, Maria. I would say the same about P.R.! Thank you, Robin. They do put on a fine show this time of year! Lovely, Eliza. I am enjoying my asters here to. They are my birth month flower. They always are the first to gently nudge me out of my denial that winter is on its way. Thanks, Mary. All through Sept. I am in denial, too. (Glad to know I have company!) Then around this time, after the equinox, I come to terms with it. I just try to see the best in every day. At least the sun still feels warm. Soon it won’t be strong enough to do that anymore, I try to appreciate it while I can. 🙂 How cold does it get where you live? The coldest it has been since I have been here is 17 below 0. It gets below 0 frequently, but doesn’t stay there. During the days it is usually in the 20s in winter, or 30s. It is usually sunny, so even cold days are pleasant with warm clothes. I do not like the bitter, biting wind, though. I do like the hibernating-ness of winter. I don’t do as much in winter, so I spend a lot of time by the fire reading or writing. I like that part. It’s a lot of work to heat with wood, and I dread that, but when we have a big wood pile, I always feel secure. Asters are saying, “go cut some wood, Mary and Bill!” Haha. How about you? How cold? I agree with Mary. I love seeing the asters but it is a little bittersweet. They make such a nice spray of colour in the woods but I also know they are a beacon for winter. I’m so excited when I see flowers. Thank u for nice pics. 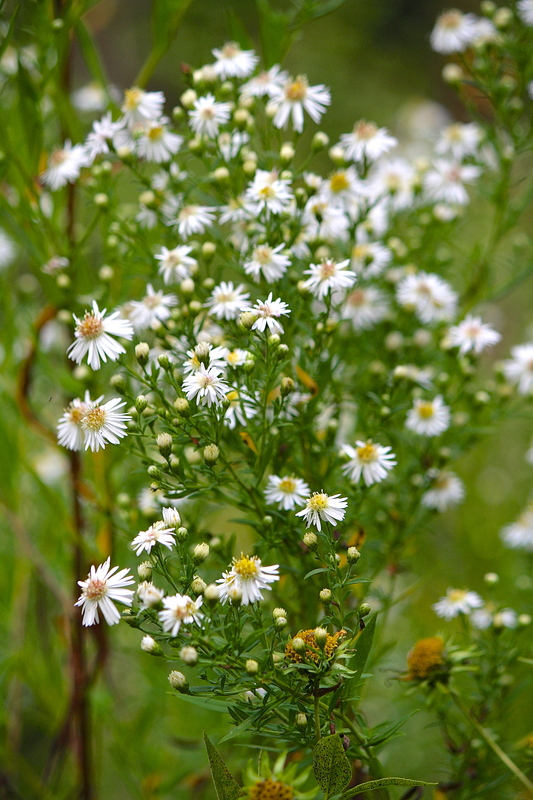 Asters are very much like daisies, aren’t they? I love daisy-like flowers: they always seem to me to be smiling up at the sun with their wide open faces. Perhaps that sounds trite, but they do look that way to me. I,too, love daisies for their cheerfulness. 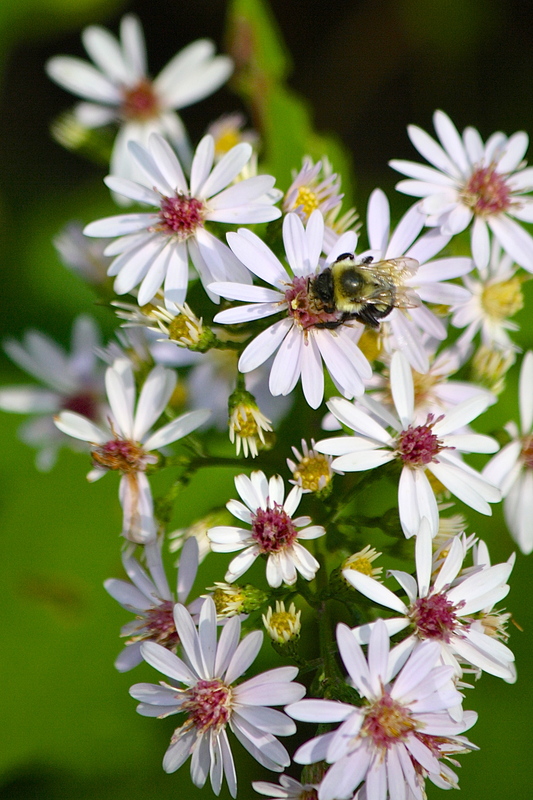 Yes, asters are in the same Compositae family. Beautiful Eliza! I have spent the past three days on our new lake property and notice there is an abundance of golden rod but also those lovely purple asters. It is my goal to leave everything alone at the lake to do its thing and only to plant true natives. There won’t be any landscaping with the exception of paths to get to and fro. It is so exciting. I love all the asters you’ve pictured here. In my village garden I have tried to propagate the purple by throwing seed heads in the beds and one year I did manage a few but they have never taken off – only those tiny white asters – they pop up everywhere and take over. I am loving the change to Fall. I am loving my garden again even though I still haven’t found time to set up a few dates. Thank you, Kathy. Going natural at your lake house will keep you in relax mode as opposed to got-to-garden mode! Love the asters, they flower here at Easter time it’s great to see them in your garden.